Plastic is a unique material. It can last for hundreds or even thousands of years without breaking down into its previous state, but sadly only 6.5 percent of all plastics get recycled and 7.7 percent gets burned for its combustible value. The rest is still here on the planet somewhere. Rot proof - wood rots of course! Water proof - wood can easily be damaged by exposure to water whereas plastic remains unaffected. Insect proof - termites and other insects can eat right through wood and make it their home but they hate plastic. No maintenance - no re-sanding, no replacing of rotted boards, no finishing the first time or refinishing after the original coat fails and in both these cases, toxic paint, oil, or varnish eventually end up coming off and becoming yet another type of pollution that gets into the environment. Cleaning recycled plastic picnic tables is easy. You can remove everything from bird poo to graffiti with soap and water. Graffiti resistant - you can use an heated repair tool to smooth out any gouges in the finish. Go ahead, try getting rid of that “Johnny loves Marry” etching in a picnic table top made of wood! They are practically theft proof to all those but the extremely determined as the larger models can way in excess of 450 lbs. That, by the way is roughly 15,000 20-ounce bottles diverted from the landfills and oceans. All of this performance from materials that where thrown away. 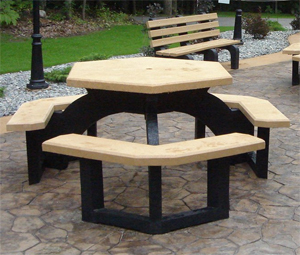 Since these picnic tables are made from recycled plastic, not a single tree dies in the process of producing them! If we continue to support an industry that makes disposable products out of plastic, we are in fact supporting the destruction of wildlife and even our own health. So the next time you sit down on a comfy picnic table somewhere in a park to have your lunch (a plastic free lunch we hope), think about what you can do personally to recycle plastic and to find alternatives for disposable plastic.